Honda’s 2016 model Civic Tourer Active Life concept car is outfitted specifically for cyclists. It is unveiled at the IAA Frankfurt last September, the World’s biggest motor show (International Motor Show, in German known as the Internationale Automobil-Ausstellung / IAA – International Automobile Exhibition). 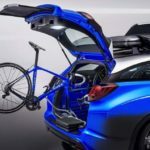 The Japanese automobile and motorcycle manufacturer has equipped the car with a rack capable of holding a pair of full-size bicycles inside the vehicle. There’s also a built-in air pump. The roof box of the car is also designed for carrying cycling accessories, such as shoes and helmets. There is even a work bench included into the kit: a retractable arm forming a makeshift workstand for mechanical operations on the bikes. 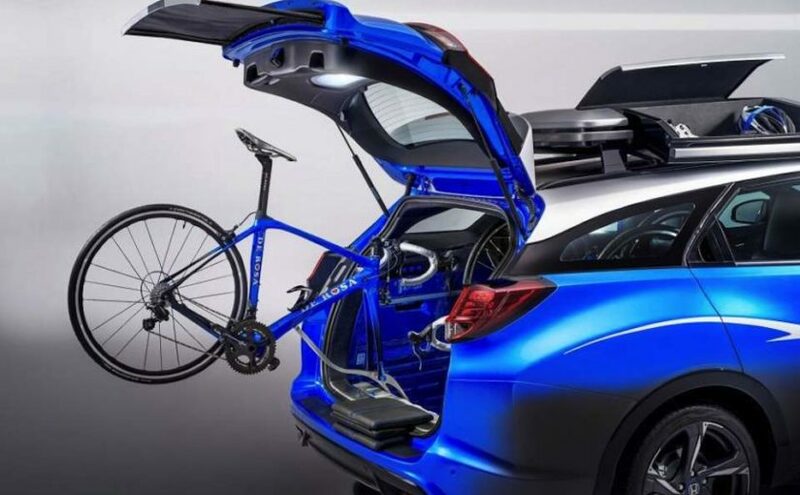 Honda Civic Tourer Active Life Concept car is equipped with a rack capable of holding a pair of full-size bicycles inside the vehicle. There’s also a built-in air pump. The roof box of the car is also designed for carrying cycling accessories, such as shoes and helmets. Civic Tourer Active Life Concept featuring a custom blue paint finish with a lower gun metallic gradation and a silver roofline.